Hayden Calnin was raised in the serene and rural town of Red Hill before spending the majority of his current adult years in the vibrant city of Melbourne, a place that embraces creativity and encourages artistic experimentation. Hayden’s work definitely represents this mindset, his musical writing crosses from folk into the realm of electronic, layered with his unique vocals and production. It’s his determination to push himself sonically as well as artistically that has helped him gain international acclaim, including sync placements on numerous USA TV shows such as Suits, Parenthood, Teen Wolf and the UK and Japanese trailers for recently Oscar-nominated, Room. Following two critically acclaimed EPs and drawing comparisons to Bon Iver, M83, Dawn Golden as well as Beach House, Hayden’s rapidly growing fan base have been asking for more releases, more tracks and more of Hayden worldwide. He decided to spend the time refining and cultivating the vision and musical ingredients behind his long anticipated album, which he’s finally completed. And that’s just the half of it… In the near future Hayden will be releasing not one, but two albums worth of breath-taking material. Produced and recorded by Hayden in his home studio, the inspiration to release ‘Cut Love Pt 1’ initially came about when Hayden was contacted by UK based, award winning, contemporary dancer/choreographer, Lukas McFarlane, who was in search of new musical material to choreograph and perform to. The result is an expedition through Hayden’s free-flowing creativity, which takes listeners on an unexpected musical journey through his internal musings on falling out of and into love, relationships and everything in between. Created from musical understanding worthy of Justin Vernon, the record delivers a sequence of captivating, emotional and honest tracks, forming an insight into the mindset of Hayden’s sonic world. The lead single ‘Cut Love’, mixed by Tim Carr (Matt Corby), instantly creates an emotionally powerful and heartbreaking impact with its captivating vocals and slow-moving piano chords. ‘You Believed’ and ‘Launch’ show a new side to Hayden’s work. The song-writing touches slightly on Ben Howard, whilst using a lower, huskier vocal frequency and displaying Hayden’s vast range. ‘So Nice To Meet Ya’ and ‘Sorry For Us’ develop a slow drum build up with an ethereal wall of harmonies and melodies written and recorded effortlessly from the heart. 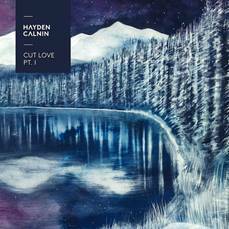 “Cut Love Pt.1” the album is a testament to Hayden’s creative abilities, demonstrating that each track can resemble a new chapter. It is experimental to say the least, but an experiment that certainly works. It’s exhilarating, truthful and vicariously touching. Ideal for putting on and leaving the world behind. “Cut Love Pt.1” 1 is available to buy and download from the 4th of March. Stay tuned for “Cut Love Pt.2” in May 2016.